The Roman Catholic Church of Kelahiran Santa Perawan Maria, which in its development is also, recognized with The Roman Catholic Kepanjen. 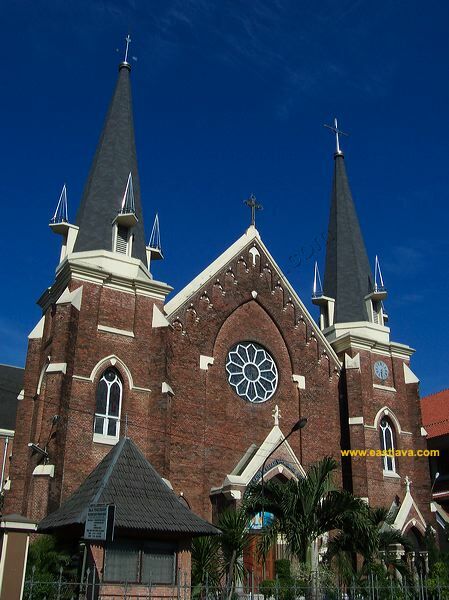 This name is more knowledgeable because this church location resides in Kepanjen Street number 4-6 Surabaya. The Church that being built in 1899 is the eldest church in Surabaya, but has just been applied one year then post it development. This postponement is caused by the church function, which have time to be displaced functioned as field hospital to overcome cholera epidemic. After Pastor Waanders had passed away, there is Pastor Moonen Pr, one of three imams who invited by Mgr. Vrancken, to went to Surabaya. Pastor Moonen arrives at Jakarta on 13 Augusts 1847. His attention focused in constructing children, particularly they being leaved by their old fellow. In consequence, in 1856 it was built SSV, which its name is known as " Relief Fund of Santo Vincentius". Second mission is restoration of church, its cost got from church cash, contribution of believer and the subsidy from government. Besides that, he also bought organ and altar delivering from Kota's Bosch, but what a pity because its engraving and relief pictures is triturated in its journey. In 1889, Pastor CWJ WENNEKER bought a piece of land in Tempelstraat (now kepanjen street). This front of Nurse Ursulin land is bought with the price of 8815 Guilders. On its development of 'Paroki Kelahiran' the Paroki Pastor at that moment is Pastor Van Santen SJ cope firm to make up a purse to realize the development of church. In 1866, Pater Van Der Hagen bought the manse land after lifted become pastor and superior to replace Pater Palinckx who moved to Yogyakarta to build new 'stasi'. This building is designed length wisely direction of west - east with architecture pattern new gothic. First stone had done by Pastor PJ Van Santen on 19 Augusts 1899. It is estimated the development of this church finish cost about 165000 guilders. 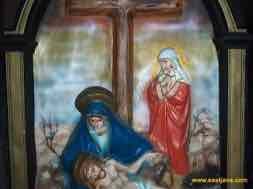 On 5 Augusts 1900, Mgr Edmundus Sybrandus Luypen blessed the church that being dedicated to Mother Marry. The architect of gothic Church is a Dutch, Westmaes. There is resemblance of this church with church Jean Baptiste Antoine, Lassus, St. Jean Baptiste de Belleville Paris that built in 1854. The Idiosyncrasy of gothic pattern is window form, door and curved roof upward and form corner. Besides sharp-pointed roof that quickening the fall of rainwater.